Most Christians already know that they should be telling their friends about Jesus. But they have been poorly equipped with methods that are no longer effective in today's post-Christian world. As a result, many people become frustrated, blame themselves, and simply give up. 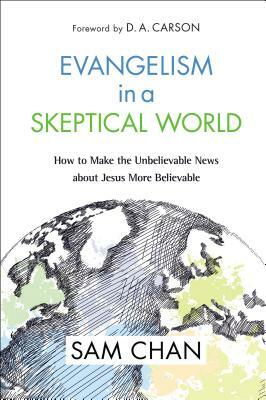 Evangelism in a Skeptical World is a textbook on evangelism that is ideal for the church or the classroom to equip Christians with the principles and skills they need to tell the unbelievable news about Jesus to friends in a skeptical world. Many of the older principles and methods of evangelism in the twentieth century no longer work effectively today. In a post-Christian, post-churched, post-reached world we need new methods to communicate the timeless message of the gospel in culturally relevant ways. Dr. Chan combines the theological and biblical insights of classic evangelistic training with the latest insights from missiology on contextualization, cultural hermeneutics, and storytelling. Every chapter is illustrated with real-world examples drawn from over fifteen years of evangelistic ministry. These are methods that really work - with university students, urban workers, and professionals - getting past the defensive posture that people have toward Christianity so they can seriously consider the claims of Jesus Christ. Field-tested and filled with unique, fresh, and creative insights, this book will equip you to share the gospel in today's world and help as many people as possible hear the good news about Jesus.